Institute Program: Click here to open a PDF brochure for more information on the Institute. 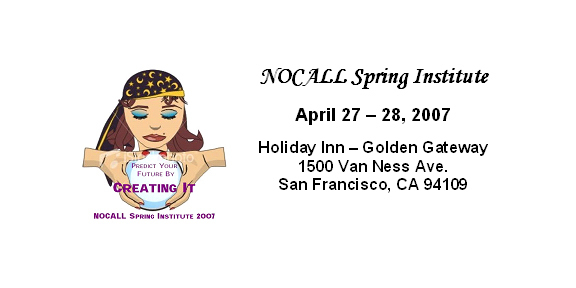 Register & pay online by clicking here: http://www.nocall2007.eventbrite.com/This year’s Spring Institute will be in San Francisco at the Holiday Inn Golden Gateway on Van Ness Ave on Friday April 27th and Saturday April 28th. The format is a little different this year. We will start on Friday morning with a skills building workshop on Strategic Planning then we will break for a wonderful lunch sponsored by our friends at LexisNexis. Kathie Sullivan, AALL Executive Board member will be our speaker. After lunch we will roll up our sleeves and apply what we have just learned to NOCALL! The goal is to come up with a mission, vision and values that afternoon. Friday evening Thompson/West is sponsoring a fun reception at Fisherman’s Wharf restaurant and museum Bistro Boudin. Everyone is on their own for dinner. Saturday morning we reconvene and get into the trenches looking at the committees and setting goals. This link also provides a PDF brochure for the Institute.OR, register and pay by mail by using this form. Parking at the Holiday Inn is available at a reduced rate of $14 per day or $30 for overnight parking for hotel guests.